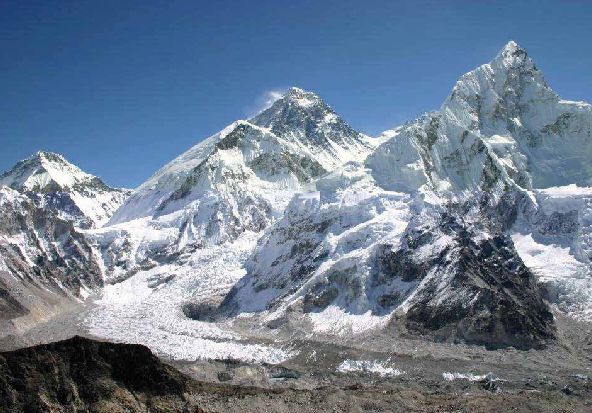 May 28, 2014 • A recently published report gives a comprehensive look at the glaciers of Nepal over the last three decades, at ten year increments (1980, 1990, 2000, and 2010). The information was derived from Landsat and Shuttle Radar Topography Mission (SRTM) data in order to provide a clear view of changing glacier dynamics in the region. The report was released by the International Center for Integrated Mountain Development, or ICIMOD, a group that aims to share environmental knowledge with regional member countries of the Hindu Kush Himalayas. The ecosystems of this mountainous region are fragile and increasingly impacted by climate change. These changes can have a profound effect on the livelihood of mountain people in the region. By providing timely environmental information, ICIMOD, wants to help mountain denizens better understand, deal, and adapt to new conditions. In 2010, a total of 3,808 glaciers were identified with a total area of 3,902 km² and estimated ice reserves of 312 km³. The average area of individual glaciers was 1 km². The Ngojumba glacier in the Dudh Koshi sub-basin was the largest single glacier with an area of 79 km². About 90% of the glacier area lay between 4,500 and 6,500 masl; with 65% between 5,000 and 6,000 mask. The contribution of estimated ice reserves is higher for a large glacier than for the same cumulative area from a number of smaller ones. Thus the estimated ice reserves were higher in basins with larger glaciers and larger glaciers are the most important reserves of freshwater. The total glacier area decreased by 24% between 1977 and 2010, and the estimated ice reserves by 29% (129 km³). The number of glaciers increased by 11%, a result of fragmentation following shrinkage. The lowest losses of glacier area (and in some cases gains) were observed from glaciers with a north or northwest aspect (of which there were very few) and slopes of less than 20°. Mountain basin type and valley glaciers also showed a lower proportional loss of area. The glaciers receded on average by 38 km² per year. The rate of loss of glacial area between ~1980 and 1990 was almost twice that in the subsequent two decades (1990–2000 and 2000–2010). Further study is needed to determine whether this reflects a slowing in the rate of change or an anomalous situation in the first period. The average annual mean temperature in the Langtang and Imja (Khumbu) sub-basins rose at an average rate of 0.12°C/year and 0.09°C/year, respectively, between 1988 and 2008. Moving average analysis showed that the rate of increase in average mean minimum temperature was significant and higher than the increase in average mean maximum temperature.